Bleiki fíllinn (The Pink Elephant) is a New Year's Eve beer, a Belgian-style IPA seasoned with grains of paradise and hibiscus, and dyed a festive pink color with beet juice. The beer is smoothly bitter with a sweet aroma of fruit and earthy undertones. 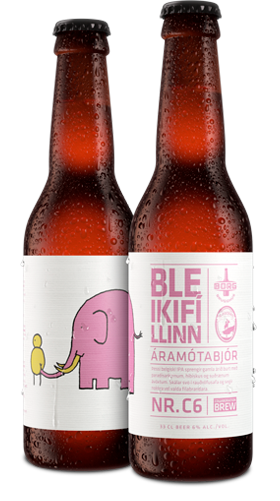 Bleiki fíllinn is a collaboration between Borg and micro brewery Gæðingur in Skagafjörður, and the name of the beer is a nod to the renowned brewery Delirium Tremens, who use a pink elephant on their bottles. Delirium tremens is a hallucinatory condition caused by severe alcohol withdrawal, and pink elephants are used to symbolize the hallucination. Used here, the pink elephant carries a word of warning for the time of year when people tend to have a drink or two. Borg and Gæðingur want to remind people of the dangers of alcohol consumption, that drinking too much has consequences, and encourage them to drink with moderation to have a good start to the new year.